Rossland Gondola | Rossland Gondola | Ecosign Mountain Resort Planners Ltd.
Ecosign completed a study to assess the viability of a gondola from the Rossland central business district to the base of the Red Mountain Resort suitable for transportation of skiers, hikers, mountain bikers and general sightseers during all months of the year. 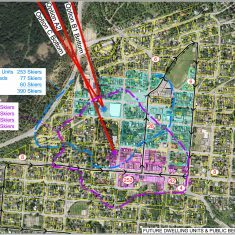 Ecosign prepared an inventory of the existing and proposed development within Rossland and at the base of mountain and analysed existing transit routes to estimate the travel demand. Various alignments were studied and a preferred route was selected. We then worked with Doppelmayr, Canada Ltd. to evaluate various gondola configurations and prepare preliminary capital and operating cost estimates. 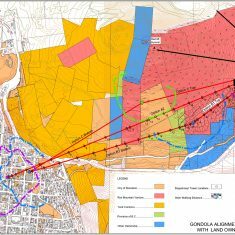 The study concluded that a gondola connection between Red Mountain and the Rossland town centre was technically feasible, but currently not economically justifiable. One of the final recommendations was that the City should take steps to reserve a right of way to allow for such a connection in the future.